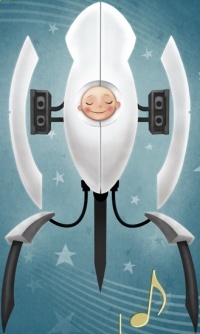 Turret Lullaby is a graphic novel released in September of 2011. This comic depicts the testing days of the Consumer Sentry Turret. The story takes place before the events of Portal. Over the period of three days, two unnamed scientists are working on perfecting the Turrets' pedestrian use as a guard against home invasion. Signifying failure through a robotic baby's cries in response to the loudness of shots being fired, they succeed when they implement a lullaby into the turret's coding to soothe the baby after the threat has been eliminated.